PREMISE:          A medieval strategy game along the same lines as M.U.L.E. honestly it's not my cup of tea. 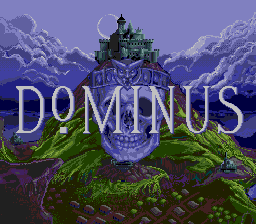 Dominus (originally for PC) was and still is a truly fantastic game, but it appears this Genesis version is either very buggy or just a test/demo or beta.